Mangroves are among the world’s most dynamic ecosystems. But increasing encroachment by development and industry means they are also among the most at risk. The International Day for the Conservation of the Mangrove Ecosystem on 26 July aims to raise awareness of the valuable services provided by mangrove ecosystems. The International Day for the Conservation of the Mangrove Ecosystem on 26 July aims to raise awareness of the valuable services provided by mangrove ecosystems. From Indonesia to Madagascar and Honduras, the GEF has invested in many projects that recognize the value of mangroves in protecting our environment. Coastal and marine ecosystems, or ‘blue forests’ include mangrove forests, seagrass meadows and saltwater marshes which improve local food security in coastal tropical regions, provide shoreline protection, and are an essential habitat for fisheries. Such ecosystems are equally important for the world’s global food supply. Healthy mangrove ecosystems are vital for the wellbeing, food security, and protection of coastal communities worldwide. Mangroves are among the world’s most dynamic ecosystems. But increasing encroachment by development and industry means they are also among the most at risk. They are being destroyed at rates 3-5 times greater than average rates of forest loss. Over a quarter of the world’s original mangrove cover has already disappeared. One of the main threats to mangroves is from habitat destruction for coastal development and aquaculture. For example, in the Philippines alone, over 50 per cent of mangroves have been lost since 1918, largely as a result of the establishment of aquaculture ponds. Pollution and over-exploitation are also reducing the ecosystem services provided by mangroves. Changes in local water conditions caused by upstream dams, irrigation and pollution have led to the loss of many mangroves. Rising sea levels are a longer-term challenge. Mangroves host a spectacular diversity of flora and fauna. They ensure food security for local communities. They provide forest products and sustain fisheries – with some 75 per cent of commercial fish species spending part of their lifecycle in these coastal wetlands. They protect coastlines from erosion and extreme weather events, and contribute to water quality by filtering out nutrients and sediments. They also fight climate change - with global mangrove forests sequestering as much as 22.8 million tons of carbon each year. Fortunately, there is growing recognition that the earth and humanity simply cannot afford to lose these vital ecosystems. Sri Lanka has become the first nation in the world to comprehensively protect all its mangrove forests. A government-backed scheme launched in 2015 includes alternative job training and microloan initiatives to promote mangrove-friendly livelihoods, as well as mangrove nurseries and replanting projects. “One lesson they are learning is that it is far easier to preserve intact mangroves than replant new ones,” says UN Environment mangroves expert Gabriel Grimsditch. Another leading initiative is the Global Environment Facility and UN Environment’s Blue Forests Project. Recognizing the vital role of coastal and marine ecosystems in supporting livelihoods and wellbeing across the globe, the project aims to improve management of mangrove ecosystems through focusing on the value of the goods and services that they provide. One Blue Forests initative, Mikoko Pamoja (Mangroves Together) in Gazi Bay, Kenya, has become the world’s first conservation project to link mangrove forests to the global carbon market. The model is set to be replicated in nearby Vanga Bay (see this five-minute video), as well as across other Blue Forest project sites globally – from Abu Dhabi to Ecuador, Indonesia, Madagascar and Mozambique. The International Day for the Conservation of the Mangrove Ecosystem was initiated by the UN Educational, Scientific and Cultural Organization (UNESCO). This is only the second year the Day is being celebrated. Eighty-six of UNESCO’s 669 World Network of Biosphere Reserves sites include areas of mangroves. Mangroves are found in 123 nations and territories, but represent less than 1 per cent of all tropical forests worldwide, and less than 0.4 per cent of all global forests. Management and restoration of mangrove ecosystems is an achievable and cost-effective way to help ensure food security for many coastal communities. Mangroves are rich in biodiversity. They provide a valuable nursery habitat for fish and crustaceans; a food source for monkeys, deer, birds, even kangaroos; and a source of nectar for honeybees. They support complex communities, where thousands of other species interact. Mangroves act as a form of natural coastal defence: reducing erosion, attenuating waves (and tsunamis) and reducing the height of storm surges. 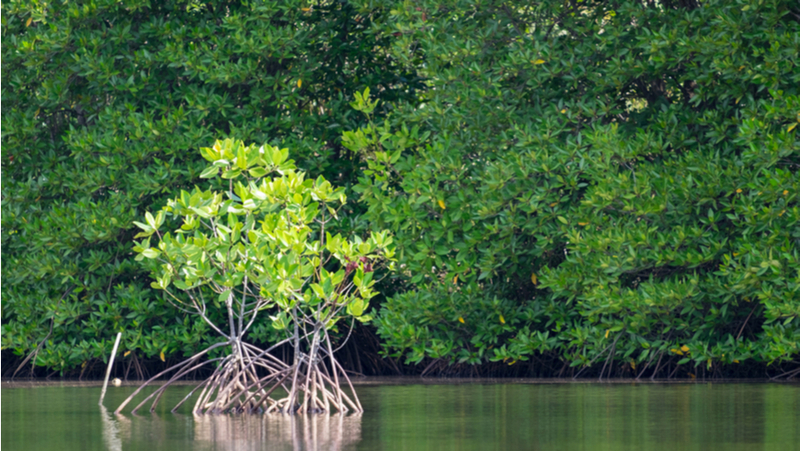 Mangrove soils are highly effective carbon sinks. They are among the most carbon-rich tropical ecosystems globally, and can contain more carbon per square metre than tropical rainforests. On average, they store around 1,000 tons of carbon per hectare in their biomass and underlying soil. If destroyed, degraded or lost these coastal ecosystems become sources of carbon dioxide and contribute to global warming. UN Environment’s 2017 report on mangrove conservation and restoration.